In college Andrés Bella, now a client services manager at Organic and aspiring visual artist, was an avid tennis player. At one point Bella considered going pro, but as college came to an end he decided on a different route. Lately he's been tapping into that relationship with tennis to create art inspired by the sport. These aren't your standard sketches or oil paintings of legendary tennis players, but a new style and medium entirely. 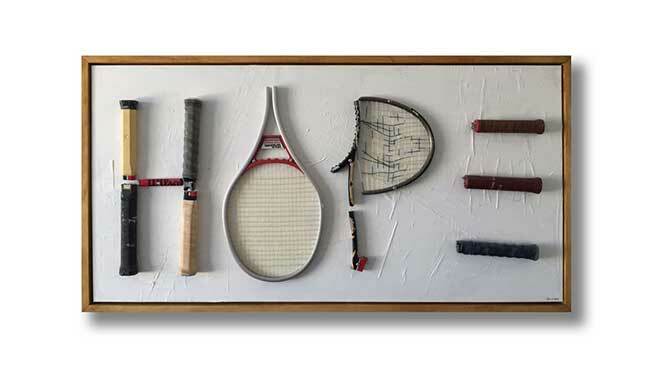 What began as portraits of famous tennis players, including Roger Federer, made from used racquets soon turned into a much larger passion project, which eventually captured the attention of Instagram. The social network recently tapped the Organic employee to lend some of his creative work to the U.S. Open for tennis fans to enjoy during the tournament. Ahead of the U.S. Open, Instagram began searching for tennis art in an effort to expand its sports community base and came across Bella's work. From there, it reached out to Bella and asked if he would be interested in showing some of his stuff, and creating some new pieces, for the tournament. "Initially we were going to be doing some portraits, but logistically it was not going to work out, so the U.S. Open reached out and asked about hashtags in a similar style that we do the portraits in," Bella said. 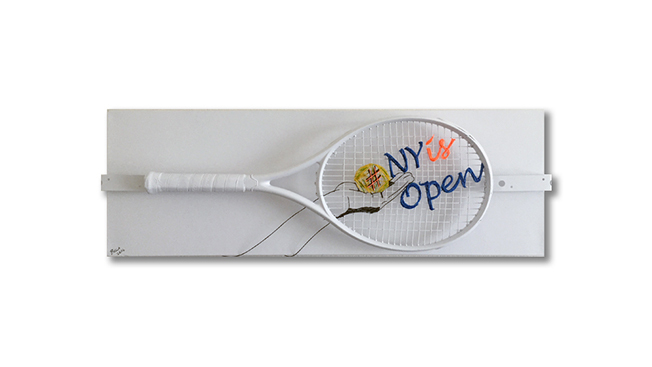 Three of the pieces being shown throughout the tournament will feature official tournament hashtags in the portrait style —including #NYisOpen, #usopen, #winning—while the other two are abstract pieces that Bella created in 2014 and 2015. 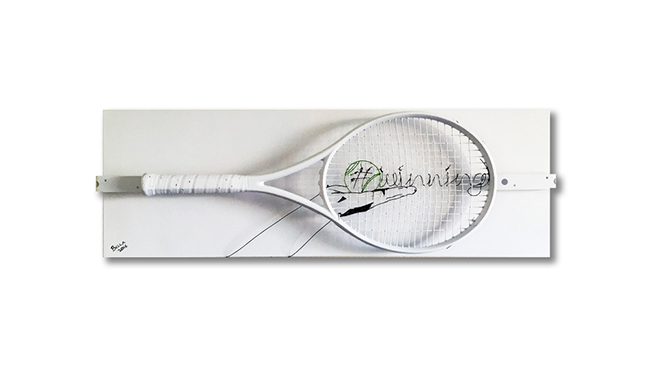 Originally Bella was inspired by the simple tennis racquet. Looking at the logo painted onto the strings gave him the idea to create portraits by painting on the strings, but he eventually took things one step further. 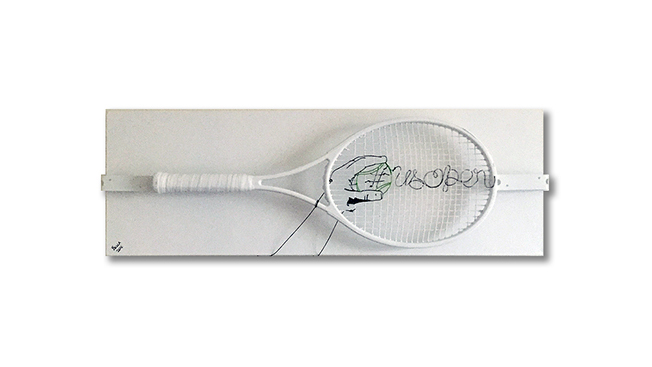 "Putting ink on the string seemed simple so I started layering the strings on top of the racquet to make the portraits," he said. From there some abstract ideas came to light. "For me I was never formally trained as an artist but I've always had that mindset of creativity. Just [from] playing tennis, those materials seemed the most natural to me. Working with them felt like a more fluid and natural process than using oil or anything like that," Bella said. Bella will be at the U.S. Open in Queens, New York, throughout the first week of tournament, which kicked off on Monday, representing his artwork alongside Instagram.